I am a new artist, self-taught and only recently re-discovered a joy for painting. My interest in art was peaked when I took classes in high school and seriously considered carving out a career in art. Unsure of whether to go ahead, I ended up taking that famous “other fork” in the road and headed toward a corporate career. Years later I re-discovered painting and as they say, never looked back. In 2011 I tried oil pastels (OPs) and was immediately sold on this medium. Except for underpaintings, my pieces are exclusively painted with oil pastels. I enjoy the challenge of layering paint to expose rich color and values, and moving and manipulating OPs around the painting surface – it’s all very fascinating to me. Landscapes and seascapes fill my portfolio; I’m interested with capturing conditions created by light and shadow. I only have to look out my window, nature provides me with an endless show of spectacular scenery; I’m never at a loss for what to paint. A special thank you to my friends in the art communities, your examples and guidance has helped me develop immeasurably as an artist. For the first few posts it was impossible for me to believe that these are handmade but after seeing your blog I came to know of a new artist!! Thank you for being so generous with your comment and for visiting my blog! Nice to meet you. Thank you Ben for your kindness and the award – much appreciated! Thank you so much – an honor to be nominated by a fellow blogger. Thank you for your kind gesture! Thank you for the kind gesture and much appreciated! Thank you Athena for your lovely comment and compliment. Nice to meet you! Delighted to have discovered you! You are so talented. Thank you so much for your beautiful comment, it’s a pleasure to meet you. I’m delighted to meet you as well and I’m heading over to your blog to enjoy getting to know you! Thank you for your visit and much appreciated comment!! Thank you so much for your beautiful comments and for the award nomination – it means a lot and is an honor to receive this recognition from a fellow blogger. Thank you very much, while I don’t accept awards I do want to let you know how much I really appreciate this generosity of spirit and thought. Found you through Elizabeth Parsons. You do lovely work! So glad to have landed here. Writers and painters and all artists, are vessels for our craft. Nice to meet you Renee! Thank you visiting – I love Elizabeth and her work. I was going through your artwork which is very beautiful. Since, I’m not an art critque or an interpretator professionally but would love to write an article on your work, hope that would be fine! Hi Iris, so nice to meet you! Thank you so much for your beautiful comment and compliment. Can’t tell you how much it means that you would take time to go through my work – thanks again! Thank you, pleased to meet you! Beautiful work Mary. Look forward to exploring your blog. Hi Anabell, lovely to meet you – thank you for visiting my blog. Thank you so much for stopping by and your lovely comment. Looking forward to more of your posts – have a wonderful week. Hi Alf, to be nominated is a true compliment and I can’t thank you enough. I’m sorry but I don’t accept awards any longer, but the gesture is both recognized and appreciated more than you know. You have a beautiful site, really enjoying your posts! Hi Mary. Thank you for enjoying my post. I really enjoying yours too. Thanks for stopping by my place and for sharing your artist journey! Hi Patti, that you very much – looking forward to more of your writings. Hello Mary, I found my way here from time thief’s onecoolsite! I enjoyed your guest post and had to check out your art work. It’s beautiful. Hi Jill, wonderful to meet you and thank you for your lovely compliment, means a lot! Mary, thank you for the follow! Most appreciated! Am really glad The English Professor at Large reblogged your piece so I could find you ! Thank you very much for your lovely comments and so glad that you found my blog – happy to see you and thank you for caring. Thanks for the like! Your art is amazing. 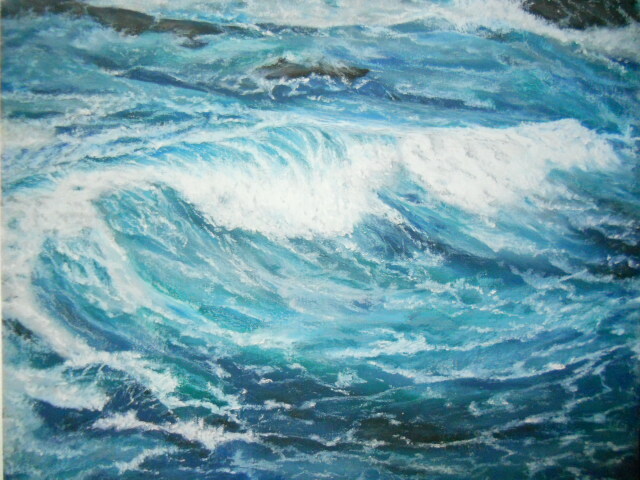 My favorites are the seascapes. Nice to see you! Thank you very much for your kind comment!